Now the company has issued another big change: limiting users to choosing from a small lineup of six movies that changes daily. The latest plan, which kicked into motion on Wednesday, limits subscribers to three movies a month for $9.95. That’s not bad, but that three-movie limit is now more restricting than ever. 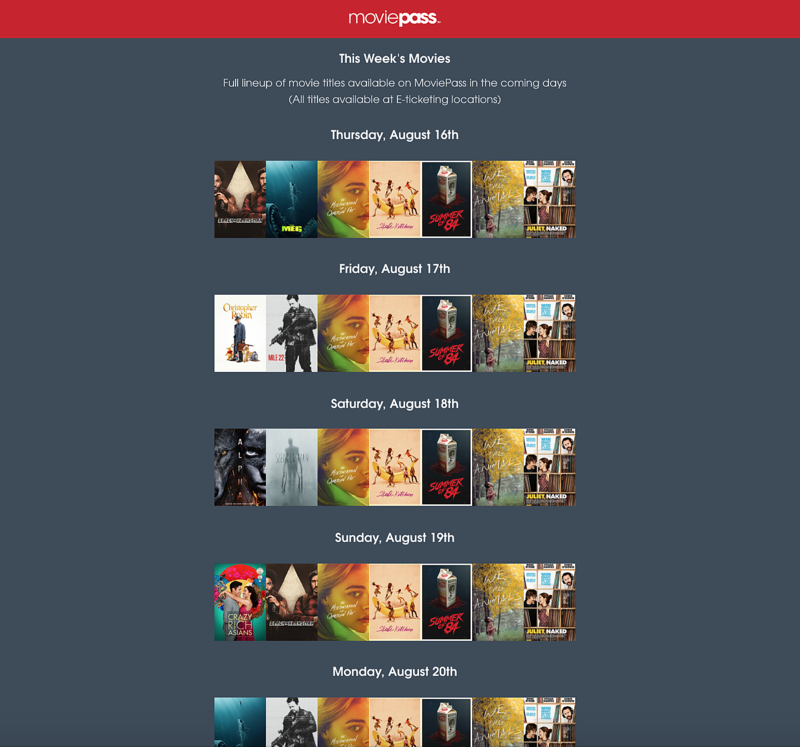 MoviePass is now deciding what movies and which showtimes you can see on certain days of the week. According to this schedule, you can only see certain movies on certain days. So if you want to see BlacKkKlansman this weekend, you can only go Thursday or Sunday. Want to see Crazy Rich Asians on opening weekend? You can only see it on Sunday. And who’s tho say it won’t be sold out on the day you’re allowed to see it. And what about the many, many movies that aren’t even on this list? Recent wide releases like The Spy Who Dumped Me, Mission: Impossible – Fallout, The Darkest Minds, and The Equalizer II are nowhere to be found (outside e-ticking theaters), at least on my app for New York City locations. How about indie releases like Eighth Grade, Sorry To Bother You, Blindspotting, or Three Identical Strangers? Nope. So much for MoviePass claiming they wanted to “bolster” indie film. And theaters that often play repertory screenings, like Metrograph or the Film Society’s Lincoln Center theaters, currently have no available showtimes. After reaching out to a rep for MoviePass about the latest change, I was told the company plans to send a letter to subscribers later today outlining the new changes and daily schedule details. Today we are rolling out our new subscription plan that was announced last week. We believe this new model provides great value to the MoviePass community and, equally important, ensures that we can continue to provide these benefits for you to enjoy into the future. As we transition to the new subscription plan, we want to share more details about our service moving forward as part of our commitment to keep you fully informed. For the time being, we will be limiting the films and showtimes that are available to members each day. During this transition period, MoviePass will offer up to six films to choose from daily, including a selection of major studio first-run films and independent releases. In addition, showtime availability may be limited depending on the popularity of those films on the app that particular day. While the films and showtimes available in the app will change daily, the schedule of available film selections will be published at least a week in advance on the MoviePass website so members can plan ahead for the films they want to see. Click here to see the current schedule. Please note that e-ticketing will continue to include ALL movies and showtimes with no restrictions. Because actual availability will change daily, we encourage our members to always check the MoviePass app before leaving for the theater. As we celebrate the one-year anniversary of our $9.95 subscription offering, we want to thank you – our millions of members – for your loyalty and for your continued support. We’ll have some exciting updates on additional features and service offerings – that will bring greater value to you as a member – in the near future. You can see the full schedule of available movies through August 26 over at the MoviePass website. And maybe consider switching to one of these alternatives.